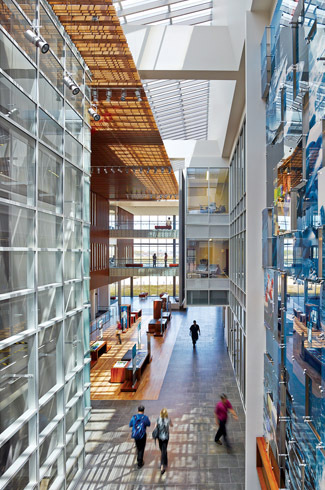 In 2017, the American Institute of Architects named the National Oceanic and Atmospheric Administration (NOAA)’s Inouye Regional Centre as one of the year’s ten best examples of sustainable design. The centre represents the coming together of two different worlds – history and sustainability. 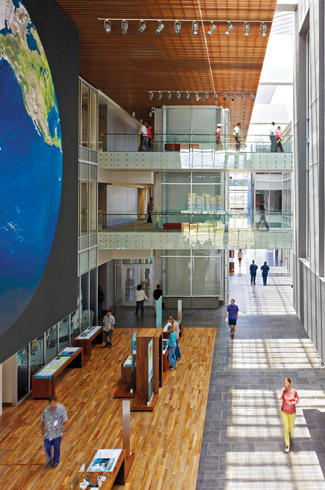 National Oceanic and Atmospheric Administration (NOAA)’s Inouye Regional Centre was selected as one of last year’s ten best examples of sustainable design by the Environment Committee of the American Institute of Architects. 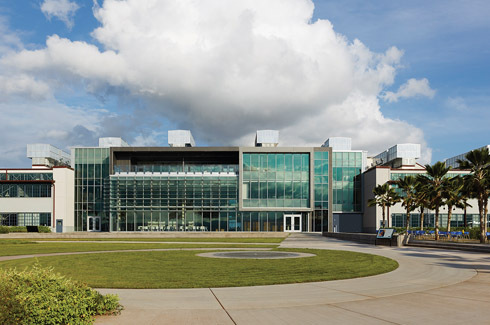 The National Oceanic and Atmospheric Administration (NOAA)’s Inouye Regional Centre, designed by HOK Architects, is located on the historic landmark site of Pearl Harbour’s Ford Island. It features the adaptive reuse of two world war II-era airplane hangars, that narrowly survived Japan’s December 1941 attack on Pearl Harbour, by linking them through a new steel and glass building. 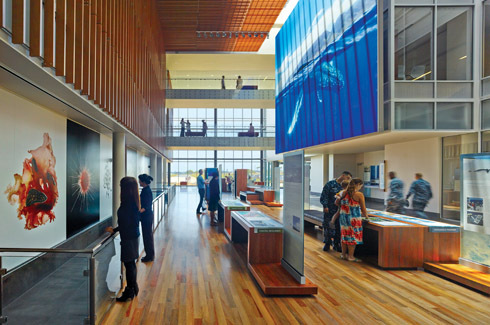 NOAA wanted to transform this endangered site into its regional headquarters, whist also creating a stellar example of sustainable design in the process. The historic landmark site with two airplane hangars that narrowly escaped destruction during the Pearl Harbour attack, along with local biological influences determined the sustainability principles used in the project. 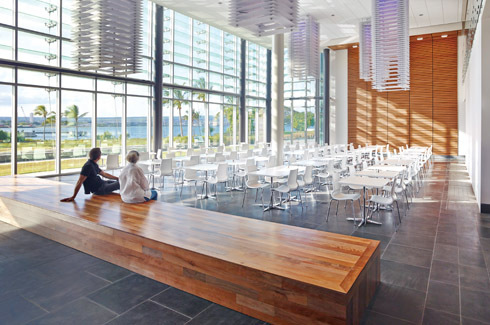 The building fosters a strong connection with the local community, promoting environmental intelligence and designating places along the waterfront for gatherings and exhibits that highlight the island’s voyaging history. At first glance, the 75-year-old hangars didn’t appear to possess the ideal foundation to create a sustainable building. For years they had sat abandoned, used primarily to store old cars. On further inspection, though, the buildings, designed in 1939 by noted architect Alfred Kahn, exhibited a lot of promise. on the concept of the monkeypod tree’s shape and function. Water conservation strategies used included biofilters to collect storm water and drought-tolerant grasses to reduce its runoff. The trees also protect themselves from hot temperatures by pulling soil moisture through the vascular structure into the leaves. Moisture released as water vapor creates a cooling effect around the canopy.This concept has been leveraged for the centre’s hydronic system that pulls water from below the sea bed into roof coils. The prevailing sea breezes pass over these cool coils and enable passive ventilation that drops the cooled, fresh air supply into vertical thermal chimneys. In this manner, the building blurs the lines between outside and inside with no temperature difference between the two. By bringing in outside air though the ventilation system and daylight through the skylights, occupants are given fresh air and natural light. The exhaust ventilation system is also 100 percent passive. Cool ventilation air is supplied using displacement principles – after being supplied at low levels, the air draws heat from the occupants and equipment, and, as its temperature rises, it becomes less dense and more buoyant, rising up through the building via interconnected light wells and atria before being exhausted in to the atmosphere. The site also implements outstanding water conservation strategies. Paul Woolford, design principal for HOK’s San Francisco office, summarises, “Virtually no storm water or greywater leaves the site.” Storm water collection is done using biofilters and aki-aki grasses that slow and cleanse the storm water runoff from the building and parking area. The entire diaphragm of the roof is a water capture device that leads to a dedicated rainwater retention tank, that caters to non-potable needs. The greywater waste, collected from electrical water coolers, lavatories and showers, supplies the site landscape irrigation systems and satisfies 100 percent of the irrigation demand. Lighting the 350,000 sqft project was no easy feat. “The deep plans of the existing hangar structures meant that daylight through perimeter windows could illuminate only a fraction of the floor area,” says Woolford. 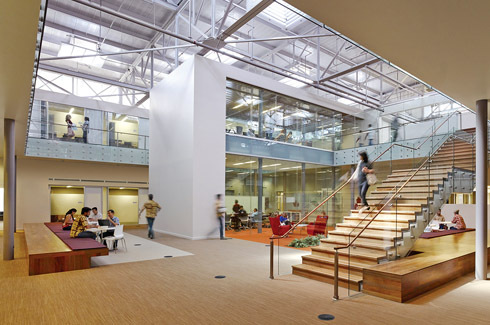 The HOK team found their solution in the use of specially crafted light lanterns. The lanterns drive daylight deep into the building by capturing and reflecting sunlight down into the space without artificial lighting. 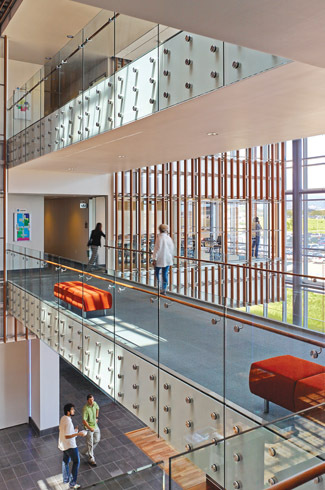 Translucent reflectors below glow-like light fixtures distribute sunlight and reflect it back up to the ceiling, which becomes a luminaire. The HOK design team reduced its carbon footprint by choosing materials that were locally sourced, non-toxic, durable, recyclable and appropriate for a federal facility, including compliance with hurricane and anti-terrorism requirements. 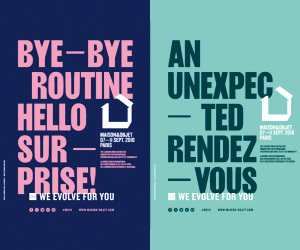 Given the site’s historic nature and remoteness, the design team made every effort to reuse the existing structure and minimise use of imported materials. Local materials such as ohia wood and basalt stone were used extensively throughout the project. Specifications for building materials ensured low-toxicity levels. A construction waste management program reduced waste by 95 percent through reuse, recycling and supplier take-back of materials.The adaptive reuse of the hangars coupled with sustainable design features led to impactful energy savings for NOAA. Construction costs for NOAA’s new headquarters came in at $435 a square foot in comparison to the usual average that ranges between $500 and $750 per square foot. Annually, NOAA saves approximately $3 million in operational costs, $415,000 in energy and $8,300 in water.